In fact, our clueless medicine show impresario has confused the last gasp of the robo-machines and dip-buyers for an endorsement of his cockamamie brew of protectionism, nationalism, populism and unhinged Keynesian borrow and spend. So rather than puncturing the bubble he accurately identified during the campaign, he'll soon be dripping with implosion splatter from comb-over to toe. Likewise, the market's post-election rip has nothing to do with a putative Trump economic boom because there hasn't been one. A 2.0% or lower real GDP growth rate is now virtually baked into the cake for Q1 based on the economic releases to date. That would amount to a $75 billion gain over the Q4 annualized level of real GDP. Accordingly, the first five quarters of the Trump Economy will have generated an average real GDP gain of $102 billion per quarter. Then again, during the previous three years (2014-2016) the quarterly growth rate was $99 billion per quarter. We'd call that a distinction without a difference. Indeed, the notion that there has been some-kind of Trump fostered economic acceleration is, well, Fake News. In fact, what we have is a plodding business expansion that is freighted down by debt and financial engineering---both gifts of a rogue central bank that has been inflicting harm on the main street economy for decades. As we have frequently demonstrated, the C-suites of corporate America have been strip-mining their cash flows and balance sheets in order to goose near-term share prices and stock option packages, thereby drastically short-changing investments in long term productivity and growth. Since the turn of the century, in fact, upwards of $20 trillion has been shunted into unproductive M&A deals, stock buybacks and leveraged recaps of every dimension. Not surprisingly, this massive diversion of cash and capital into Wall Street has left main street high and dry. What counts for growth and productivity, of course, is net investment after inflation and replenishment of capital consumed in current year depreciation and amortization. As the chart makes clear, there hasn't been much of it. Real net investment in 2016 was still 28% below its level in the year 2000. And relative to real GDP, the story is even more dismal: The average net investment level in 1999-2001 computed to 3.8% of GDP, whereas during the most recent three years it averaged only 2.5% of GDP. Given this dismal long-term trend in real net investment, it is not surprising that real final sales growth since the pre-crisis peak in 2007 has slipped to just 1.3% per annum, or only one-third of its historic 3.3% trend. So even if the Donald had an honest money/pro-growth agenda, which he most definitely does not, it would be nearly impossible to quickly extricate the US economy from the low growth rut shown in the chart below. And that get's us to the real cause of the so-called Trump Slump. What's happening is that the Keynesian doctors at the Fed have been taking the boys and girls in the casino off their meds, and the latter are now beginning to feel wobbly. 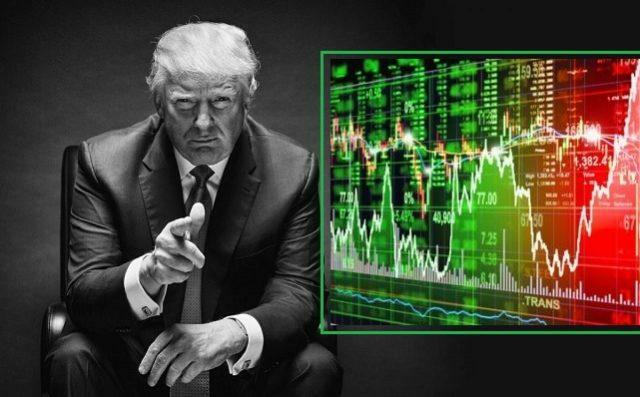 While the Donald's tweets and policy lurches have been the proximate triggers for the recent plunges, the real cause is the reluctant recognition in the casino that all the Fed's epic money pumping has failed to ignite any real economic acceleration, and that an epochal tightening shift in monetary policy is now actually happening---both here and abroad. Indeed, we think the punk number that will be added to the bar chart below when the initial Q1 results are posted by the Commerce Department in three weeks will be the straw that breaks the camel's back. After that, the business expansion will be bumping up against its 1990s tech era expansion record of 119 months-----even as the headwinds of steadily rising bond yields, faltering growth in Europe and Asia and a sharp slowdown of the post-coronation economy in China gather intensity. The truth is, the Donald has done absolutely nothing to help the US economy since January 20, 2017, but has piled on immense harm by stumbling into the most irresponsible fiscal policy in modern history. Yet with the Federal deficit now heading toward $1.2 trillion or 6% of GDP in the year ahead, there is no way to avoid a conflagration in the bond pits. The resulting "yield shock", in turn, will finally puncture the Great Bubble that has been inflating since Greenspan panicked at the time of the October 1987 stock market meltdown and launched the present era of monetary central planning. Still, when one arm of the US government is borrowing at a $1.2 trillion rate at the tippy-top of the business cycle, while the central banking arm is dumping bonds at an annual rate (i.e. $600 billion) which exceeds the level outstanding as recently as 2003, you are talking about a fiscal/monetary collision like never before. Needless to say, there is not a chance that the debt-bloated US economy can weather that conflagration unscathed. Indeed, it can be well and truly said that the entire nine year so-called recovery has been wasted. If nothing else it was at least a chance to modestly deleverage the US economy----so that monetary normalization could occur with a minimal amount of breakage and disruption on main street. To the contrary, there has been no deleveraging at all. Compared to the modern 100 year norm (from 1870 to 1970) of a 1.5X debt-to-national income ratio, the national leverage ratio now stands at 3.47X and that's virtually no change from the 3.58X level that triggered the financial crash in 2008. Stated differently, had the US stayed on the straight and narrow, and had it not launched into a rolling national LBO over the last 35 years, the total public and private debt outstanding would now be $30 trillion, not the $68 trillion shown below from the Fed's flow-of-funds report for Q4 2017. The irony, therefore, is that the main street economy is failing because it is lugging around $38 trillion of extra debt---yet its supposed to be rescued by the very King of Debt. We'll take the unders on that one, but also note that the Donald inherited an economy that was leveraged at 3.49X national income in December 2016. That's not even a smidgeon of difference from where we are now. So don't blame the Donald for the impending day of reckoning. He inherited the current debt-bloated monetary deformation. And like all the Presidents before him---- since Ronald Reagan got bamboozled by Wall Street into abandoning his desire to return to a Bretton Woods style hard money standard----he has no clue about how to avoid the financial crack-up which lies around the corner. During our appearance on the Cavuto Show today on Fox Business we expanded on these very same points.